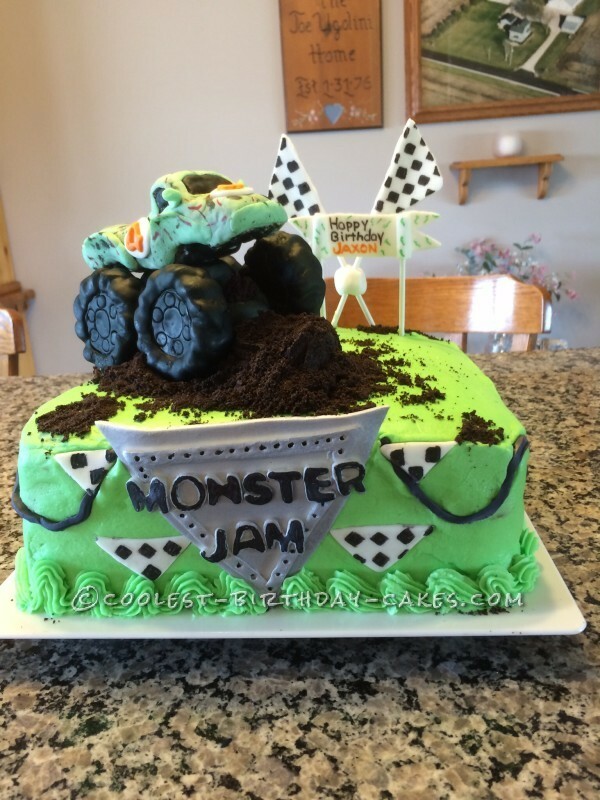 Coolest Homemade Monster Jam Cake - All Edible! This cake is homemade and a hundred percent edible , except for 4 lollipop sticks. 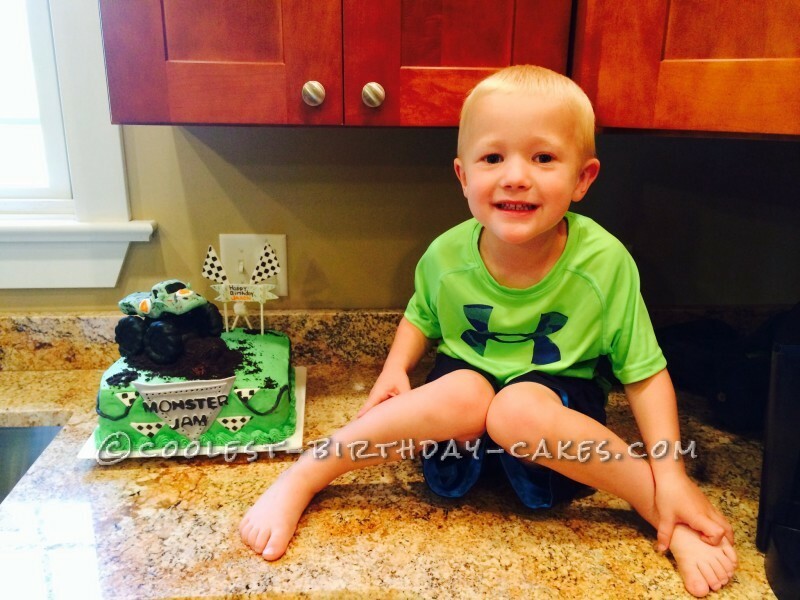 This year my Grandson Jaxon told me for his 4th birthday cake he wanted a Monster Truck cake, he must have a 100 monster trucks….he loves them. I said ok that’s what I’ll make you ! But I was thinking….oh my goodness how will I ever pull this one off !? For the Monster truck I used rice Krispy treats to form a base for the truck ( so that the truck would be a little bit above the wheels) I covered the base in black fondant so it wouldn’t be as noticeable, and this is what I actually attached the four tires to & then attached the rice Krispy , fondant covered truck to. I made the cake using two 10x10x2 inch cake pans and out a layer of homemade buttercream frosting between the layers and then covered the whole thing in homemade buttercream frosting. For the dirt I used chocolate frosting for the base of it and then crushed Oreo cookies for the dirt on top. When my Grandson saw his cake he had the hugest smile on his face and was jumping up and down saying that is AWESOME. He Loved It, which made making this cake more than worth the effort involved ! Oh and one more thing I’d like to share is, being I make everything homemade, I don’t wanna make a whole batch of rice Krispy treats each time I want to make a figure out if them, so my secret is is to keep a big family sized value pack box of the individually wrapped rice Krispy treats in the pantry……for the truck itself it probably only took 3or 4 squares . Just unwrap about how many you think you’ll need ,put them in a bowl and microwave them for 20 secound or so to soften them up, rub crisco on your hands and then form them into whatever shape you need !! Hope this helps someone !